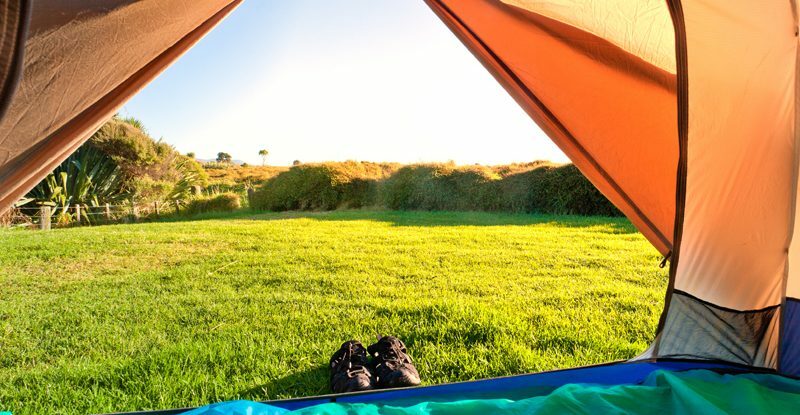 Camping no longer has to mean “roughing it.” In fact, with the best camping air mattresses on Amazon, camping can be luxurious. So, say goodbye to camping and say hello to glamping by enjoying a good night’s rest on one of these fabulous air mattresses! Coleman is a brand known for putting out high-quality camping supplies, and their Soft Plush Top Quickbed is no different. As the name implies, it has a cushioned, velvet-like sleeping surfaces for superior comfort. It also features ComfortStrong coils to properly support you as you catch some Z’s. This particular model is queen-sized, so you will have plenty of room to sprawl out on your own or share it with a partner. When you’re done, simply fold, roll, and store. Being elevated from the earth is not only more comfortable, it creates a feeling of safety and security. The Intex Comfort Plush Elevated Airbed takes both comfort and security to the next level by incorporating tough Fiber-Tech construction, the stability of Dura-Beam design, and the comfort of a plush top. It even has a built-in electric pump that can inflate the mattress in approximately four and a half minutes and includes a duffel bag for easy storage and transport. This two-person inflatable mattress weighs in at just 5.6 pounds, making it perfect for campers of all types. The benefits of the Lightspeed Outdoors Air Mattress don’t stop there, though. The TPU construction not only allows it to be lightweight, but it also contributes to better temperature stability, abrasion-resistance, and even the elimination of those unpleasant plastic smells. As an added bonus, this mattress includes a battery-operated pump that makes set-up a breeze. The SoundAsleep Dream Series Air Mattress has a name that inspires thoughts of a good night’s rest full of relaxation and sweet dreams. Thankfully, it lives up to this name by incorporating ComfortCoil Technology to provide adequate support and superior comfort, as well as a SureGrip bottom that ensures stability. It also makes set-up extremely easy with its patented one-click internal pump. Throw in the included one-year warranty for peace-of-mind, and you have the complete package. The built-in pump included with the Intex Raised Downy Airbed will have you sleeping peacefully in under five minutes. That means after a long day of travel, all you have to do is start the pump, sit back, relax, then climb into your incredibly comfortable inflatable mattress. When you wake up after a dreamy night of rest, simply use the electronic pump to deflate the mattress, pack it up in the included carrying bag, and store it compactly. The Etekcity Air Mattress is the perfect mix of portability and comfort, making it ideal for camping. The slightly raised sleeping surface keeps you off the cold, possibly wet ground, allowing the temperature to remain more stable. It also comes with a rechargeable pump, allowing you to forget about carrying spare batteries because you can simply recharge it in the car. The two-year warranty is nothing to scoff at, either, especially if you plan on using the mattress outdoors. The SoundAsleep CloudNine Series Air Mattress should probably be considered the eighth wonder of the world. It features integrated dual smart pump technology that continuously inflates the mattress to keep it at the perfect firmness all night long. Even better, you can adjust the pump between three comfort levels to adapt the mattress to your preferred sleeping firmness. Throw in ComfortCoil Technology that guarantees structural integrity, and you have the ultimate air mattress for comfort. The Coleman Airbed Cot offers an elevated sleeping platform without the added heft and bulk of a larger mattress. In fact, the mattress is light and durable, featuring ComfortStrong coils to keep it comfortable and firm throughout the night use-after-use. It even includes a battery-operated pump for quick inflation. The cot integrates two side tables for convenient storage of cell phones and other items you may want to keep close at hand while camping. Best of all, you can leave the cot behind if need be, allowing the mattress to be used on its own. In a stroke of genius, Intext designed the Pillow Rest Airbed – an inflatable mattress with a built-in pillow. Using the integrated electric pump, this mattress inflates to not only act as a supremely comfortable raised sleeping platform, but also as a pillow. That’s right; the end of this mattress is raised ever-so-slightly to form a cushy, comfortable pillow, eliminating the need bring one with you on your next camping excursion.